We’ve probably learned more about genetics from the fruit fly Drosophila melanogaster than from any other organism, and now we’re using the species to learn about development and gene expression. I used the species, and several of its relatives in its 9-species subgroup, to study speciation, for the generation time is short (about 12 days at 25°C), several of the species are easy to breed in glass vials, a lot is known about the genetics of several of the species, and some of the related species cross easily with each other, facilitating the genetic study of reproductive barriers. That in fact is what I did for most of my career: cross subgroup species together and try to work out the genetics of the barriers that kept the species from exchanging genes. But one thing has plagued the evolutionary study of this species and its well-studied sister species D. simulans: they are easily found in association with humans, but where they live in the wild is unknown. They clearly became human commensals some time ago, but there must have been a wild ancestral population that gave rise to the domesticated descendants. Are those populations still around? If so, what do they live on? Genetic studies tell us that the species evolved in southern Africa and then spread throughout the world beginning 10,000 years ago, but that’s about all we know of its life in the wild. 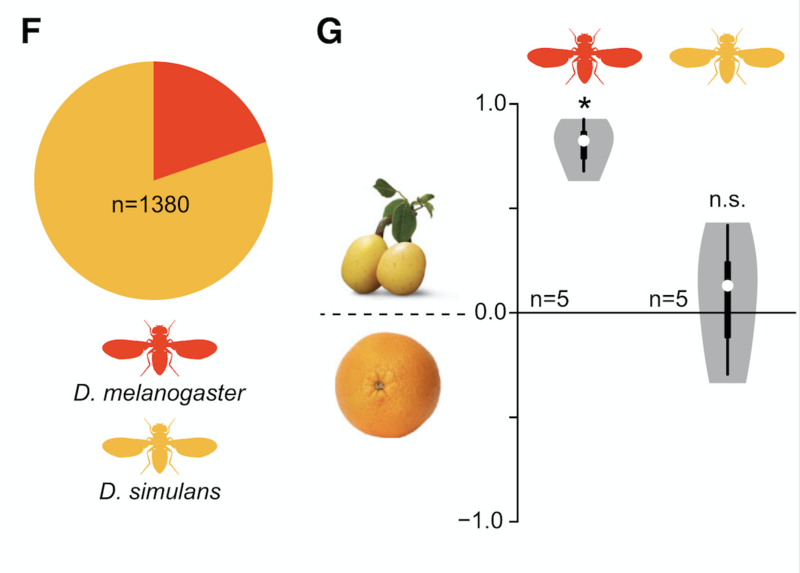 If we knew something about where D. melanogaster lives in the wild, we could perhaps expand our knowledge of its genetics to knowledge of its ecology, allowing fruitful (fruitfly?) studies of ecological genetics. Well, a new study in Current Biology (click on screenshot below for free access, pdf here, and reference at bottom) hasn’t completely solved the problem, but does pinpoint one natural resource that D. melanogaster lives on in the wild: marula fruit. Marula fruit comes, of course, from a marula tree, Sclerocarya birrea, native to woodlands of southern Africa. The fruit is seasonal, appearing synchronously among trees only two or three months a year, and is collected and eaten by humans and a lot of animals. It was once claimed that elephants (who love marula) would get drunk from eating a lot of naturally fermenting fruit, but it turns out that that doesn’t happen: there’s not enough alcohol in them to make an elephant even slightly buzzed. The authors of the paper mounted an expedition to Matapos park in southwest Zimbabwe, located within the putative ancestral range of D. melanogaster (henceforth, “mel”), but far from human habitation. They found a lot of marula fruit during the season, and collected flies attracted to traps baited with marula. They also found the sister species, D. simulans (henceforth “sim”), also a human commensal whose wild hosts were unknown, but sim didn’t like marula baits as much. (They also were less attracted to the fruit than were mel.) 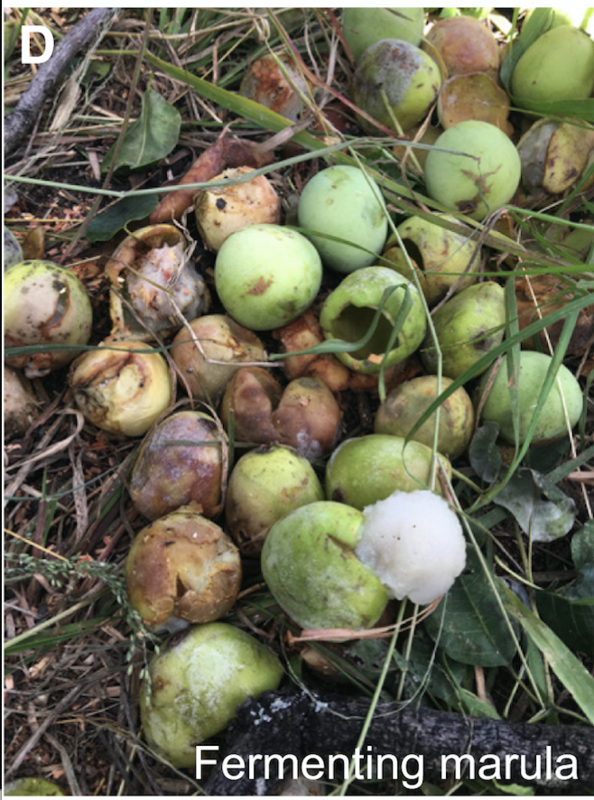 The marula fruits on the ground were teeming with mel larvae and eggs, but the authors don’t report whether or not they found sim breeding on marula. I’m pretty sure there would be some. Clearly, wild mel can live on marula. This doesn’t mean that the fruits represented the ancestral host, but simply are one host now, and are a potentially important host for the ancestor, since marula is found in the wild. In fact, marula cannot be the sole host because the fruits aren’t around for most of the year. (No other fruit hosts were reported, but it’s pretty clear that mel and sim require some kind of soft, fleshy fruit or berry to breed.) 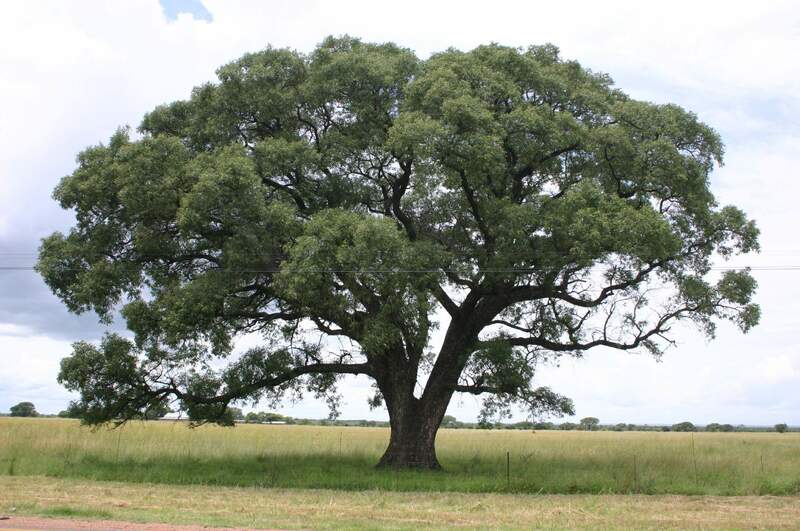 Further, mel is found in forests to the north that don’t have marula trees. (All captions from paper): A) Location of the Matopos National Park, Zimbabwe. (B) View of the park, showing extensive mopane woodland cover with interspersed kopje rock formations. Photo: M. Stensmyr. 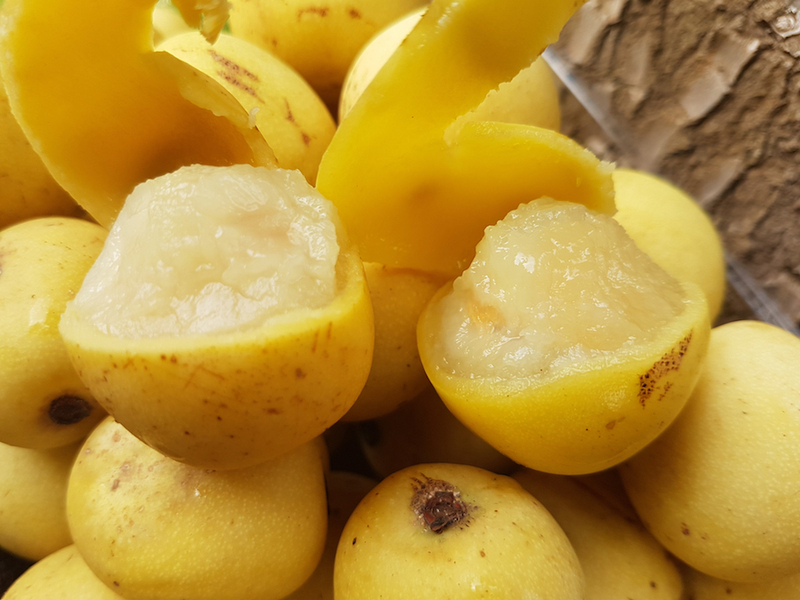 Fermenting marula fruit. Flies love it! Here’s the relative abundance of mel (red) and sim (yellow) as well as their oviposition preferences when given a choice of (non-wild) oranges or marula fruit. As you see, mel loves marula a lot more than does sim, breeding almost exclusively on the marula. (F) Proportion of D. melanogaster to Drosophila simulans from all collection sites. (G) Violin plots showing oviposition indices (OI) of wild D. melanogaster and D. simulans (color code as per F) provided a choice between traps baited with marula or orange. White circles show the median, and boxes show the 25th–75th percentiles, which are extended by whiskers indicating 1.5× the interquartile range from the 25th–75th percentiles; the shape denotes the density estimate and extends to extreme values. Deviation of the OI against zero was analyzed for significance (∗p < 0.05) with a one-sample Wilcoxon test (p < 0.05). 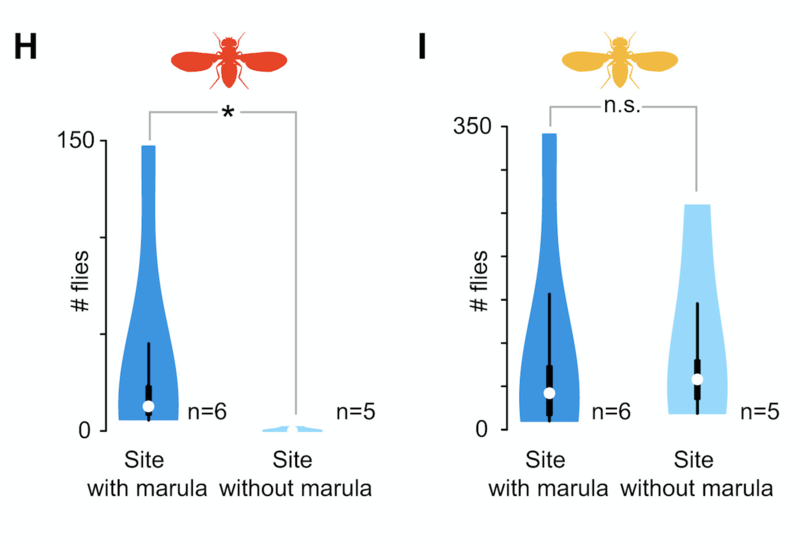 Below you see in the sample of sites (5 or 6) that mel (red) is associated only with sites having marula when the tree is fruiting, whereas sim (yellow) is found at sites with and without the fruit in equal numbers. In the wild, D. simulans is probably more of a generalist than is D. melanogaster, though that’s not evident from collecting them around human habitations. (H and I) Violin plots showing the number of D. melanogaster (H) and D. simulans (I) caught at sites with or without marula. Violin plots are as per (G). Differences between the means were analyzed for significance (∗) with a Mann-Whitney U test (p < 0.05). There’s a bit of genetics in this study, too: a volatile ester associated with marula, ethyl isovalerate, activates an olfactory receptor found in mel but not sim: an allele of the Or22a gene. Those forms of the gene, common in areas having marula but not elsewhere, are likely what attracts the flies to the fruits, though the tendency of flies to lay eggs on the fruit, as opposed to moving toward it, are based on separate genes. The marula-San link offers a plausible scenario by which D. melanogaster became a human commensal. The smell of the stored marula emanating from the caves would have attracted flies from far and wide. Flies would have found a steady supply of marula and fermenting leftovers inside the caves, long after the fruit’s presence in the surrounding woodlands had diminished. In other words, the time frame for using the optimal breeding substrate would have been increased considerably. Inside the caves, the flies would also have benefitted from a reduced risk of predation, as well as protection from adverse weather conditions. Over time, the cave flies would have accumulated adaptations helpful for human commensalism. Relevant traits may have included a willingness to enter darker enclosures and an increased tolerance of ethanol, both of which differentiate D. melanogaster from its closest relatives. The archeological record indicates that systematic and intensive marula use began ∼12,000 years ago. At ∼9,500 years ago, marula harvesting reached massive proportions, finally ebbing out ∼8,000 years ago. These dates coincide with demographic data from D. melanogaster, which point to a within-Africa expansion starting ∼10,000 years ago, an expansion presumably representing the dispersal of the commensal population throughout its new niche. In short, archeological and demographic data would support the notion that marula use by the San may have been a factor in turning the woodland species D. melanogaster into the cosmopolitan species of today. In this way D. melanogaster are like domestic cats: the domestication was self-induced by being attracted to food accumulated by humans (in cats’ case, it was probably rodents infesting human grain). The difference is that humans probably fed and cared for those cats that were tamer, whereas humans derive no benefit from taming flies. The flies simply evolved an association with humans because it was good for the flies. Now the species is everywhere in the world, and probably flies around your fruit bowl. Mansourian, S., A. Enjin, E. V. Jirle, V. Ramesh, G. Rehermann, P. G. Becher, J. E. Pool, and M. C. Stensmyr. 2018. Wild African Drosophila melanogaster are seasonal specialists on marula fruit. Current Biology 28:3960-3968.e3963. This entry was written by whyevolutionistrue and posted on December 17, 2018 at 1:00 pm and filed under genetics, insects. Bookmark the permalink. Follow any comments here with the RSS feed for this post. Both comments and trackbacks are currently closed. What a fascinating article. I had no idea that Drosophila spp. were so completely associated with humans, and that the wild relatives were so elusive. Thanks for taking the trouble to explain this conundrum. I’m curious about the life cycle of the flies, in particular whether they have eggs that survive cold weather (or if adults can survive it). Might flies survive through that part of an annual cycle during which the marula fruit isn’t around? That was a great post. I am not sure flies can be tamed? Maybe like honey bees are ‘coerced’ to do work for us. Fruit flies are ‘coerced’ to do genetic experiments. When I was young I used to think animals like horses, dogs, and cats were the most useful for the human race. After reading WEIT long enough I get the impression it’s flies, bees, and ants that we owe the most to our survival. Interesting. And now I want to try Amarula. I’m an Australian. Despite that, I love Amarula. Despite buying it for years, I found it difficult to remember its name. I’d had to ask for the cream liquor like Baileys but with the elephant on the label. It’s readily available everywhere. In Germany this year I could also buy it in supermarkets. I remember seeing it on the shelves of the hotel bar in Tanzania. I was thinking that “I’ll give that a try”. But seeing the comment that “it’s like Bailey’s”, I’d probably give it a miss. Here is a factoid that I worked on years ago. Someone noticed that if one collects Drosophila inside wineries around well-fermented juice, you found only D. melanogaster. If you collected out in the vineyard, you got also a sibling species, D. simulans. We then showed that melanogaster survives at much higher ethanol concentrations than does simulans and that melanogaster has much higher levels of the enzyme, alcohol dehydrogenase (ADH), that catalyzes the initial step for metabolizing alcohol. One side of the family holds its liquor better than the other, a common occurrence at weddings I’ve attended. [Tries to imagine a Drosophila wedding.] I’m sure there is a relevant “Far Side”. Someone should check relevant ADH activities. Next up, Saccharomyces cerevisiae? I believe that’s another (rather more beloved*) commensal for which we know little of its natural distribution. *I mean among those not geneticists. Some have argued that we owe Saccharomyces for the invention of civilization. I think they stretch that WAY too far – but it certainly provided a reason to stay put and grow grains. Fascinating. All those late undergraduate nights sorting and injecting DNA into melanogaster eggs (with a mouth operated injector!) it never occurred to me to wonder where the wild populations came from. Late every summer I notice the flies around my fruit bowl. I always wonder, where did they come from? Did they come in with the fruit, or were they already in the house? Definitely commensal. I find I don’t mind them, unlike other flies. Except when they get in my wine. Thanks for dissecting this article and for the considerable value you’ve added. It is an interesting walk on the near wild side. These flies are lovely little beasts and we owe a lot to them and their intrepid handlers for our understanding of how the evolutionary world works. Your response made me wonder whether you worked with fruit flies before you went to graduate school or was that world new to you? Interesting post. On a whim, I looked up the Amarula Cream liqueur and discovered that it is available at my local liquor store. Hooray for globalization! I didn’t know Drosophila was that cosmopolitan! I think I have a new respect for mel. If they evolved with the San, they’re definitely something to admire. They seem to have adapted to many kinds of fruit we humans eat. Bananas, apples, peaches, etc. I now live in a fruit based agricultural area of Idaho. Lots of apples, peaches, and grapes for wine production. Does this fruit taste anything like guava? It is a fruit I’ve never seen – but I haven’t shopped at any of the Africa-connected places here in Ottawa (and they are all very small). Interesting stuff! And good to know. Very interesting… wondered why all that fruit on the ground has not been eaten by bush pigs or other similar animals.